(CN) — Kyrsten Sinema has won the U.S. Senate seat in Arizona, flipping it from Republican to the Democrats. Her opponent Martha McSally conceded on Monday after Sinema’s lead grew to 38,197 votes at 5 p.m., a 1.7 percent margin. Sinema appeared to be trailing as the polls closed on Election Day, but as absentee returns came in she rolled up large margins in Phoenix and in McSally’s own congressional district in Tucson. 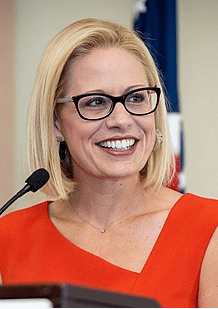 In addition to flipping the seat to the Democrats for the first time in 42 years, Sinema will become the first woman U.S. senator in Arizona history. About 170,000 ballots remain to be counted, according to The Arizona Republic, but with the trend going to Sinema, McSally would have to roll up a 23-point edge in those ballots to regain the lead. Sinema, 42, is a three-term congresswoman from Arizona’s 9th District, in Phoenix and its northern, western and southern suburbs. Though she entered politics as a Green Party liberal, she became markedly more conservative upon entering Congress — so much so that she endured sniping from the left for siding too often with Trump. Her conversion to moderate conservatism helped her win Arizona this year, where many voters, particularly suburban women, were turned off by Trump’s divisive rhetoric, unpopular tax cut and repeated attacks upon Latinos, who make up 31 percent of Arizona’s population. Despite the closeness of this election, Sinema may be able to retain her seat for a long time. Arizona’s demography is shifting from old and white to young and Latino. In 1980, 75 percent of Arizonans were white; that decreased to 58 percent in 2008. The Latino share of the state’s population increased from 16 percent to 30 percent in that time. Anglos make up more than 80 percent of elderly Arizonans, while Latinos outnumber whites in the youngest age categories, according to the Population Reference Bureau. And the 2010 Census found the median age of Anglo Arizonans to be 43, while the median Latino age was 27. Finally, in 2006 there were 1.2 births for every death among white Arizonans, and 8.9 births to every death among Latinos.